Most little boys and “ghouls” will dress up and ring neighborhood doorbells hoping to collect a large stash of candy this Halloween. 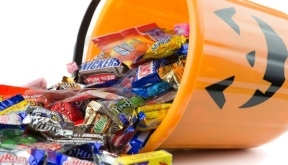 After trick-or-treating, Delta Dental of Illinois encourages parents to pay close attention to the types of treats children bring home to protect their teeth from sugar terror. Nearly four of five Illinois households pass out Halloween candy, according to the Delta Dental of Illinois Children’s Oral Health Survey. Chocolate was the number one treat handed out (82 percent), followed by chewy candy (33 percent), hard candy (33 percent) and caramel (17 percent). Aside from choosing chocolate, Delta Dental of Illinois offers these tips for making this a tooth-friendly Halloween. Encourage children to have a good meal prior to trick-or-treating so there will be less temptation to fill up on candy. Kids should brush their teeth or at least rinse with water after eating sweets. Remember that high sugar diets are detrimental to oral and overall health, and children should always brush their teeth at least twice a day with fluoridated toothpaste, floss once a day and visit the dentist regularly. Give kids something other than candy. Another option is to let children trade in their treats for a toy, and then donate the candy to the troops or a local dentist buy-back program. Some houses don’t even pass out candy. In fact, nearly 25 percent of Illinois parents hand out non-candy items, such as toys, money or fruit. For additional tips on how to help keep kids’ teeth healthy during Halloween and all year long, visit the Tooth Fairy’s Halloween website at ToothFairyTrickyTreats.com. © 6707 Chicago Hispanic Newspaper, Lawndale News, Hispanic Bilingual Newspapers, Su Noticiero Bilingue. All rights reserved. XHTML / CSS Valid.